The feel of something implied by the look: When people look at things, they imagine what they might be like to touch, so a certain degree of touch-type feeling goes with looking. A design can look warm, smooth, cool — all descriptions of how the website design might feel if you could somehow touch it. The feelings — emotions — inspired by a visual design: Design affects users emotionally, although everyone’s reaction is different, and the same person’s reaction can vary at different times. How it feels to use the website: The process of moving around and accomplishing tasks on a website can feel smooth and easy, difficult, or in-between. A website can have a “feel” before you “touch” it by trying to use it. The overall “feel” of a website changes as you use it, as you add that kind of “feel” information to the part that you get just from looking at the design. Different people can mean completely different things when they talk about the “feel,” or the “look and feel,” of a website. Whereas the “look” part of a website is the responsibility of the project head, who usually has a graphic design background, the interactive parts of the “feel” of a website can be the responsibility of several different people. This can include usability people; front-end programmers; interaction designers; and graphic designers. In a well-run team, everyone gives opinions on everything, but the ongoing responsibility for each aspect of the website is also clear. Bringing the pieces together, a well-run organization will usually have standards for the look and feel of all its websites, external and internally focused. The standards might be applied loosely for low-use, short-term, and internal websites — which are often cobbled together from existing pieces anyway — but applied more strictly for large, highly visible projects and more novel ones. 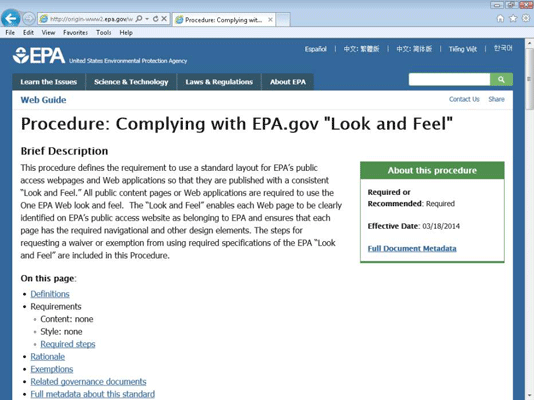 Check out the look and feel standards for the U.S. Environmental Protection Agency (EPA). These standards are such a focus for the EPA that they have a name, One EPA web. Notice the strong wording used — “complying” and “requirement” for using the standard. So be ready to be creative on new projects, but to respect and improve, rather than replace, your organization’s standards as you do so.